The SoloComb has been described as being amongst the most humane inventions within the equestrian industry and has been endorsed by the world´s professionals and vets. The SoloComb is the original humane grooming tool. It is ergonomically designed and fun to use. It contains top quality, precision-engineered hardened stainless steel blades. This ingenious comb is designed to shorten and thin hair by way of back-combing hair and then thinning or shortening via a clipping action. 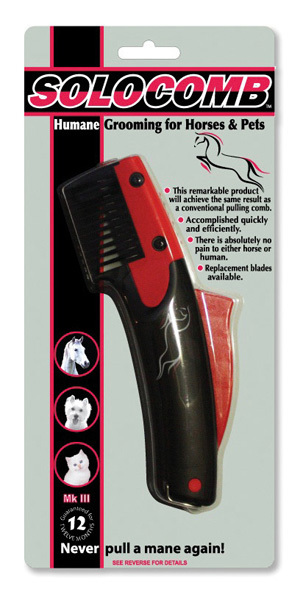 SoloComb - Mane Trimming Tools. SoloComb steals the show. Overall choice going to the SoloComb. Excerpts from Horse Journal staff article, Vol. 16, No. 3, March 2009 For Horses - Many horses and ponies hate having their manes pulled. SoloComb solves the problem, creating a tidy mane without discomfort or aggravation. It is an essential item for anyone who wants a tidy mane and tail. For Pets -"We love it", Awarded safest product tested by Whole Cat Journal (USA magazine). Grooming can be carried out safely without risk of injury to the user or the animal. Quietly and safely clips and removes tangles, without distress to the animal, particularly around sensitive areas like the ears or Eyes.